Notable for its translucent appearance, pale yellow or yellowish green colored Basil Oil is derived from fresh leaves of Ocimum Basillicum plant via hydro distillation method. The derived aromatic oil has long lasting fragrance. 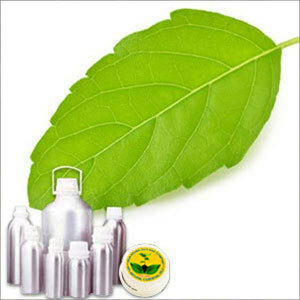 Basil essential oil is enriched with elements like Methyl Chavicol, eugenol, linalool, eucalyptol and (-)-bornyl acetate. The top note fragrance of this essential oil is slightly similar to the aroma of balsam and woody scents. The strong, pleasant and pungent smell of this oil lasts for longer period. Basil Essential Oil mixes easily with other essential oils like hyssop, lavender, Melissa, eucalyptus, Bergamot, lime, clary sage, lemon, clove bud, marjoram, juniper, geranium, rosemary and neroli. The obtained basil oil is also reckoned as Winter cherry, Sweet basil, Indian ginseng, common basil, Kanaje, Ajagandha, Samm Al Ferakh and Ayamodakam. The offered Basil Oil is added in bathwater, utilized via inhalation and is also used for massaging purpose. The application of this oil on skin helps to treat dull and dry skin. Moreover, it helps to boost blood circulation level. The rejuvenating effect of this oil both on mind and body is beyond any doubt. It acts as highly effective antiseptic solution when mixes with other essential oils that include thyme oil.